A Combined Maritime Forces (CMF) warship supporting CTF-151, the counter-piracy task force, engaged with local fishermen during a port visit to Salalah, Oman, this week. 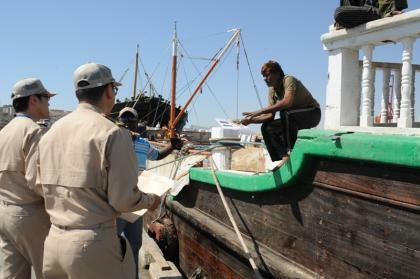 In an effort to raise awareness of the CMF mission and explain how their behavior might be misinterpreted by commercial vessels passing through their fishing grounds, the Ship’s Company of Japanese Ship Harusame handed out leaflets, written in both English and Arabic, and discussed how to avoid being mistaken for pirates. The CTF-151 area of operations includes three of the world’s six maritime chokepoints, including the busy Bab El-Mandeb strait, which are transited by hundreds of merchant vessels every week. 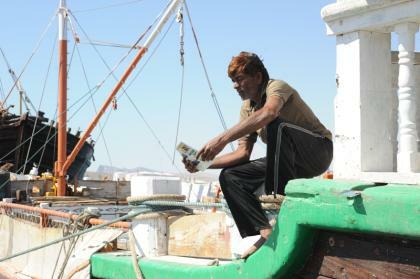 Although piracy-related incidents have been much reduced thanks to international organisations like CMF, NATO and the EU Naval Force, as well as independent deployers from nations committed to the safety and security of the region, merchant sailors are still wary of close contact with small boats which could pose a threat, and so the number of piracy-related false alarms remain high. As such, CTF-151’s mission includes engaging with local fishermen and other legitimate users of the seas to ensure they do not provoke a misunderstanding from the merchant vessels’ onboard security teams.